It is not funny when a senator can't tell the difference between Android and iPhone, it is dangerous. Republican Steve King's questioning Google CEO Sundar Pichai about an issue with a rival's technology this month is breathtakingly revealing of the ignorance that is part of the US and all the world's legal systems and those elected to govern us all. You can't expect anyone to know everything. And as much as we might not like it, for most people in the world there really isn't a difference between Android and iPhone. Except, most people in the world are not making decisions that affect all the rest of us. Then this particular mistake has been ridiculed yet even that mocking has hidden the real punch in the story. For Steve King's thinking Google makes iPhones is not crucial, it's what happened when he was corrected that is. Pichai explained the difference and King did not care. He cared enough to take up time asking the question but he didn't want the answer. King was playing to the crowd. This was accusing Google of showing children comments they shouldn't read. This was politics: being seen as accusing Google meant something to King where actually understanding it, actually getting an answer, did not. It's not as if Pichai were there to answer tech support questions, either. He was supposed to be questioned by the House over privacy concerns and location tracking. He was there to answer about Google's plans for a censored search engine in China. 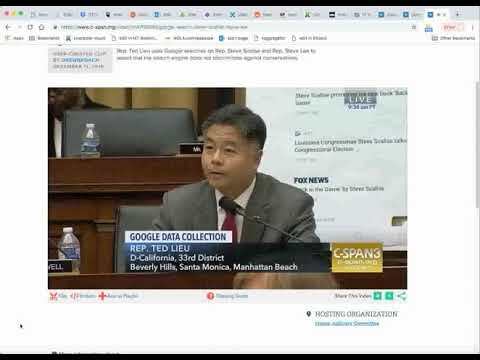 You have to give credit to congressmen and women who did ask about this but the discussion was so brief that Pichai was able to deflect it all. We're not saying (here) that Google is doing anything wrong, we're saying that we cannot know whether it is or not -- and that this type of hearing is where we should find out. But, you can blame individual politicians from both parties for choosing to spend more time on trivialities such as why searches for themselves turn up bad news. Yet you have to blame the system when, for instance, Mark Zuckerberg is able to game Congress by just talking a little slowly. He was questioned by Congress after the Cambridge Analytica scandal that saw personal information being harvested. He was questioned by Congress after allegations that Russians and others used Facebook to influence elections. What we got was every senator being given five minutes to ask a question. They got five minutes on camera and that was it. In that time there was little chance to probe and none to follow up. Zuckerberg could fill every five-minute turn with promises about Facebook's investigations into these allegations. Or he could just throw in another apology and soak up some seconds that way. And, when it wasn't any given Senator's turn, and the cameras were facing away, most left the chamber, some never to return. This also happened with Pichai's testimony. So much for trying to understand what's going on. There were people who delved. Republican senator John Thune got in his opinion that he isn't "convinced Facebook's users have the information they need to make decisions" about their personal data. Thune was right. Senator Bill Nelson, a Democrat, said "if Facebook and other online companies will not or cannot fix the privacy invasions, then we are going to have to. We, the Congress." Nelson was also right, but we suspect nobody is going to like what pops out, assuming it is crafted by the same folk at the hearings. This is the United States Congress. It was created by the US Constitution. There can be no body more part of the DNA of the nation than this and it has been so for over two hundred years. Yet, you already know that Congress won't fix the privacy issues facing us and you know it because you've seen that Congress doesn't understand or is too swayed by the almighty Silicon Valley dollar. There are politicians from both sides and all parties who do understand technology and who are working for our interests, but the system is over-loaded with people who do not grasp the importance of the decisions they're making. What we have is people in power making decisions over topics, time and again, that they are either fundamentally incapable of grasping or that they simply don't care about. Earlier this month, for instance, Rudy Giuliani accused Twitter of allowing "someone to invade my text with a disgusting anti-President message". This is the current Administration's cyber security advisor accusing Twitter of allowing a politically-motivated hacking of his personal account. We all know PC users who've had a problem on their computer and assumed it's a virus. Giuliani wouldn't have been the first to panic -- except that he didn't panic. He lobbed this incendiary accusation at Twitter because he did not understand how tweets work. To save space or because he doesn't use computers as much as we do, he wrote a tweet that had no space between sentences. That left the last word of one sentence separated from the first of the next by just a period. That's a web address. Or it is if you're designer Jason Velazquez in Atlanta and you see that you can create a website with it. You can disagree with his making that website be anti-Trump but you can't call it hacking. You've seen this a thousand times before but then you're a Twitter user, you're not a cyber security advisor who won't listen to the facts. Giuliani has a team of experts and you can see for yourself that Twitter users weren't shy about explaining his error. Yet it didn't make one iota of difference. He didn't retract the accusation, he didn't delete the tweet. This combination of attitude and lack of the facts isn't new. Just go back to 2006 when then-Alaskan senator Ted Stevens failed to comprehend how the internet works but tried to explain it to us all anyway, famously saying that "it's a series of tubes and if you don't understand, those tubes can be filled." Arrogance and ignorance is dangerous because someone who has both will never learn anything. They will never accept they don't already know and so they won't listen to actual argument. That's painful enough when it's the bore in your local bar but add in power and the whole world is in trouble. Stevens didn't understand and he believed he knew more than we do, but he also had power. He was in charge of a Senate committee that at the time was looking at regulating the internet. All court hearings are theater and justice should be blind. You can't blame someone for not knowing something but you can blame them for not finding out. You can blame them for having and using the power to make decisions that they either have no capability of understanding, nor or interest to learn anything about beyond who is going to seduce them with lobbyist dollars. These people all have large staffs. They all have advisors who do know what they're talking about, and even if they don't want to listen to them, they certainly have family members that know and who surely won't fail to speak up. But yet, time and again, it's apparent that our judges and elected officials just can't be bothered to learn one whit about what they're deciding on. It's far from being a US-only problem. This is common the world over and maybe it's a reflection of how technology is changing so fast that people can't keep up with it. Yet, the system is replete with people young enough that they don't know a world without this technology, and it is only going to escalate. We don't even care what party gets elected for any given position. We need those knowledgeable with technology to step up on both sides of the aisle, we need the system to help them get there, and we need it all right now. Politics always tried to adjust economy. Economic growth is always due to technological advancement. It is unfortunate politicians failed to understand technology. But they won't admit because they will be disqualified to lead. A place where you can ask questions? I don’t know, maybe the Google homepage? I was laughing too but then I thought about it, Google has a large presence on many iPhones so the question actually was ok. (Can’t believe I said that) Google still is the default search engine on Safari, (too) many people use Chrome, way too many people use Gmail and YouTube is owned by Google. All of these products affect how the iPhone gets information so Pichai should have been able to partially address the question. The obscene image popped up within a game, supposedly an iOS one from the App Store. What would Google have to do with that? He offered a great answer IMHO. That does seem to be a plague during the current and last two presidencies, yeah. Are you trying to make a point germane to the editorial? While the editorial is true and accurate, it could easily be construed or devolve into the currently popular "Government is a: "Crooked" or b: "Incompetent". I would add a third: C: Way too partisan -- meaning looking out for self interest rather than the nation. When congress wants to get it right, they can, they have -- and I have hope that they will. But, right now, their motivation is to please powerful interests (and often that simply means to attack and tear down the person in front of you) rather than look out for the best interests of the nation and its people. In short, their incentive is to look good to those who support them rather than do good for the nation. Growing up in the 50's & 60's I saw a government that made mistakes -- but they were inevitably guided back to the right course because the loyalty of people in it was to the nation. I hope that we can return to that. Respectfully, legislators routinely write rules in areas where their knowledge ranges from almost nothing to less than nothing (that is, what they think they know is actually false). The only thing legislators have a consistent grasp of is how to take a previously legal activity and make it illegal. Some people laud legislators, treating them as something special; but it seems to me that their only consistent area of knowledge is in rationalizing initiation of violence. Some legislators may have actual fields of knowledge; but, that is not something consistent and shared by all. A 7-year old child in the midst of playing a game served up from Apple's App Store wasn't opening Safari, going to google dot com and searching for anything. Not even spades. And no that was not the point nor focus of the article in the first place. We spelled out that case pretty positively. It seems there is a class of people who believe that they are too busy to learn or understand technology. They have iPhones and watches and iPads, but they don’t want to take the time to learn how to use them. They have other people set them up and they don’t really know how to use anything on the devices and get frustrated and tend to blame the company who made the product rather than accepting the fact that they need to learn more about using their device before passing judgement on it. Why do you think Apple is pushing “Today at Apple” so hard? They have hard data on consumer confidence going way up after attending relevant classes on using their device. You are so right in what you say. I've been using and programming computers for 46years (shudder) and technology has gotten so complex that many devices have capabilities that most of us don't know about. We use what we need to know about for our use case. Someone else picks up the thing and does something totally mind blowing/gobsmacking with it without thinking and we look on in amazement. Sometimes I long for a return to the old days but then I realise I'm being an old fool. I'm just looking forward to puzzling out my new Electric Car in the new year. It should be fun. Face it folks, this is why things in this country are so screwed up when it comes to laws and regulations, the people making the laws have not idea and the people who are lobbying them to write the laws in a particular way know the people making the laws have no idea. Our congress basically do what others tell them to do. When they have these hearing they do not even prepare their own questions some staffer who know even less or worse think they really know write the questions. In the end we get stupid regulations that cost everyone and most time eliminates or reduces competition. The other thing the law makers who are mostly lawyer make laws knowing full well they are not constitutional and figure the courts will sort it out. The law makers then can say they pass the laws but it was the courts fault it got thrown out.